Riches of the Nile Casino | A Betable online casino with big treasures! Step into the exciting Riches of the Nile online casino - A gambling site way down the ancient Egyptian cities with plenty of treasures and games! If you like to use Betable while gambling, Riches of the Nile casino is the best new UK casino option for you right now! The golden age of ancient Egypt is waiting with all its powers. Here, you get to meet the Sphinx while sailing down the Nile – one of the most mythical rivers on the planet. Big treasures, such as a great welcome bonus, are waiting for you here. You can also become a Betable VIP player while gambling on some of the most spectacular and popular slot games right now. 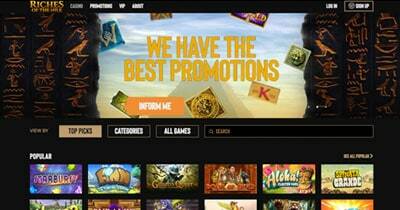 It’s surely not the first time we see the Egyptian theme among the world of online casinos. Plenty of slot games takes us to the tomb of the pharaoh, gets us to meet Cleopatra or finding a mysterious book of Ra. However, among casino themed, it is not as common. Temple Nile casino, a brand from IVY, is also a brand that also plays with this theme. Both look really good, and we believe it is from player to player which one is the best one. But, for Betable players – Riches of the Nile is the one! The welcome package gives you both . deposit bonus as well as spins. Once you have signed up and made a deposit, you get the possibility to take advantage of this sweet starting bonus. Make sure to read the terms and conditions so you get to know which slot games that the bonus applies to as well as some other requirements. One thing that always is really important to check out while playing at a new casino is the VIP club. This one is an invite-only club by Betable. Once you have reached the VIP level, you will be offered special birthday bonuses, hospitality packages as well as special events. On top of this your very own manager. Read more about the Betable loyalty club and how to get the invitation at the casino’s website. There aren’t too many games to choose from at this online casino. This might be a problem for some players, why we want to give a heads up regarding this. However, the games you can choose from are popular and really nice. You also have a couple of jackpots to choose from, Divine Fortune as an example. It is a fine looking website with a great welcome bonus and the unique Betable payment options from ActiveWin. 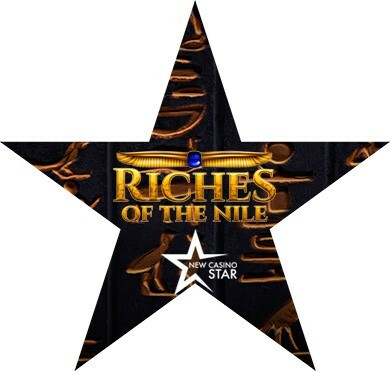 Go and visit the Riches of the Nile casino now and try it out!